Studies have shown that massage can help cancer patients with their symptoms of pain and depression. In a 2009 study researchers found that breast cancer patients who were given regular massage felt better and didn’t get upset as much as a control group who did not receive the massage3, and a 2015 meta-analysis of multiple studies found that massage treatment helped cancer patients manage pain4. If your friend says yes, just hug. Let yourself breathe and relax into the hug. Don’t squeeze too tight – you don’t want to suffocate your friend because that will make future hugs less likely. If your friend says yes, give a simple, gentle shoulder massage. For this, we want to be relaxed and not put too much pressure – you don’t want your hands to get tired, or to hurt your friend. One more possibility is to simply sit back-to-back and try to feel each other breathing. If you can match your breaths to be at the same rate, even better. Again, 5 – 10 minutes is ideal, though even 1 minutes is helpful. Sit back to back as comfortably as possible. Sitting cross-legged on the floor works well for some people, or putting two chairs next to each other can also work. Keep your back as straight as possible while staying relaxed – try not to hold yourself too rigid. You can talk or joke or read or just focus on breathing – the most important is to do your best to simply maintain that contact. Moberg, K. U. (2003) The Oxytocin Factor: Tapping The Hormone Of Calm, Love, And HealingPinter and Martin, London, UK. Lee, S. H., Kim, J. Y., Yeo, S., Kim, S. H., Lim, S. (2015) Meta-Analysis of Massage Therapy on Cancer Pain. Integrative Cancer Therapies 14 (4): 297-304. 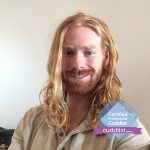 Corwin Duncan is a Professional Cuddler with Cuddlist and he is based out of Denver, CO.
You can book a session with Corwin here. You can also follow Corwin on Cuddle with Corwin & Everyday Mental Health.